The Acorn Quad Train comprises of two, three or four oscillating AutoClay 320's mounted on our famous heavy-duty cross country Quad Trailers. These can be towed with any quad bike, tractor or lawnmower with a standard 50mm tow ball. 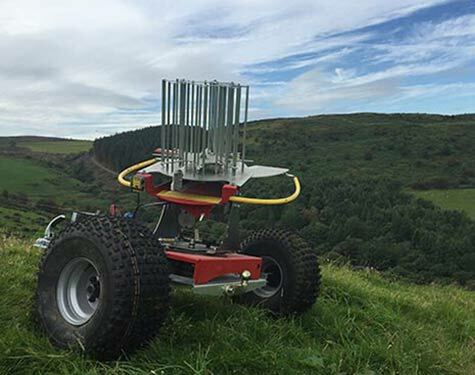 Open Up New Terrains - Deploying traps on more areas of the clay shooting range much easier. Easily Transportable - Can be placed on a suitable trailer with the clays and any other shooting equipment. The trailers are designed to be coupled together enabling quick and efficient set up on the clay shooting range. The Acorn Quad Train can be arranged in an infinite amount of configurations - clustered, converging, diverging, or crossing - your imagination is your only limit. Acorn's Simulated Game Radio Controller Trap Shuffle enables 1 to 100 targets to be launched in a random flush sequence at the touch of a button. Using the real time speed launch control knob will give an individual or up to 12 guns a competitive, uniform (and therefore fair) clay shooting challenge. The choice of carousel sizes or Midi inserts gives the freedom to use Standard, Midi or any desirable stack combination of either clay types. The large 85Ah Battery can be fitted on the Quad trailer frame for ample power throughout the day. To further enhance your system, the vertical lift is also available as a modular unit.